CALGARY — It’s a good thing wool is flame resistant, what with the smoking times Gavin Mutch laid down in the North American Sheep Shearing Challenge at the Calgary Stampede Sunday night. 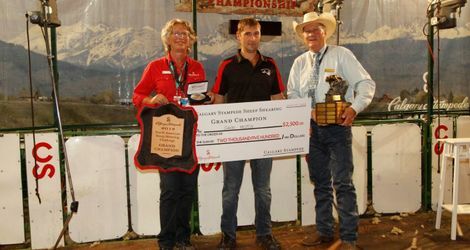 The 2012 World Champion sheared a sheep in 46 seconds in the semi-finals, the fastest time posted at the event held in the Victoria Pavilion over the weekend. For Mutch, shearing these days is about working smarter, not harder. Mutch took the Champion title in the final round against Timothy Wright of Hart, Michigan with a score of 30.83 to Wright’s 39.88. Mutch received a Stampede belt buckle, a commemorative silver bell, a slunk and a cheque for $3,500 for his win. Reserve Champion Wright received a belt buckle and $3,000. Mutch, who qualified to take part in the 2019 World Shearing and Woolhandling Championships in France before coming to the Stampede, isn’t shearing as much as he used to. That’s relative, though. “I’ve cut right back now. At the peak, it was about 75,000 (sheep) a year. I probably only do 20,000 or 30,000 now,” said Mutch, who has a family farm with sheep and cattle back home. With more than $11,000 in cash prizes and awards up for grabs, competitors in the North American Sheep Shearing Challenge went head-to-head in the timed and judged event. On each of their four sheep (six in the finals), shearers were scored on how many passes they completed, the quality of the cut, any nicks on the sheep, leaving wool on the sheep, and — of course, time. In shearing, the lower the score, the better. In the Intermediate Division, David Higgins of Ellensburg, Washington was named Champion with a score of 47.9, while Amber Petersen from Cornwall, P.E.I. took Reserve Champion with her score of 48.63. The International Team Championship went to Team USA, composed of Wright and Hilary Gietzen (Minot, North Dakota). Prior to the competition, Mutch paired up with three-time Stampede Champion Mike Pora to conduct a two-day shearing clinic for local shearers and fellow competitors alike. (Pora, from Australia, just missed qualifying for the final round this year.) In a place like Canada that doesn’t have a deep history of sheep shearing, it’s important to share the knowledge that comes with that hard-won experience, Mutch said. Every shearer has a unique story on how they got into the time-honoured industry. Take Intermediate Class competitor Tracy Jarratt. A fibre artist, Jarratt wanted to recreate a fabric from the Middle Ages for a weaving project, but needed a rare wool. She tracked down an Alberta farmer with Icelandic sheep and started buying fleece from her. When the farmer retired, she told Jarratt she was giving her four sheep. “I said, ‘I live in a two-bedroom apartment. What am I going to do with four sheep?’ She said, ‘Board them.’ So a lady in the same spinning club I belonged to said she’d house the sheep in her barn. Now we have 70 sheep between us,” Jarratt said. That was in 2000. At the time, Jarratt faced a problem common to many acreage farmers: four sheep really aren’t much of a paycheque for a shearer. So she enrolled in a course and started doing it herself. It just happened that a CBC crew was filming at the shearing school. Then, the footage aired. That practical education propelled her to the Intermediate class Champion in the Stampede’s North American Sheep Shearing Challenge in 2015. That win came shortly after a two-year break from shearing. Jarratt, who broke her back as a child, underwent spinal fusion followed by extension rehabilitation. She loves working outdoors, the people she meets and the animals she cares for — “the ones with names and histories.” It’s also her “sheep diet”: Jarratt lost 120 pounds after she started shearing. 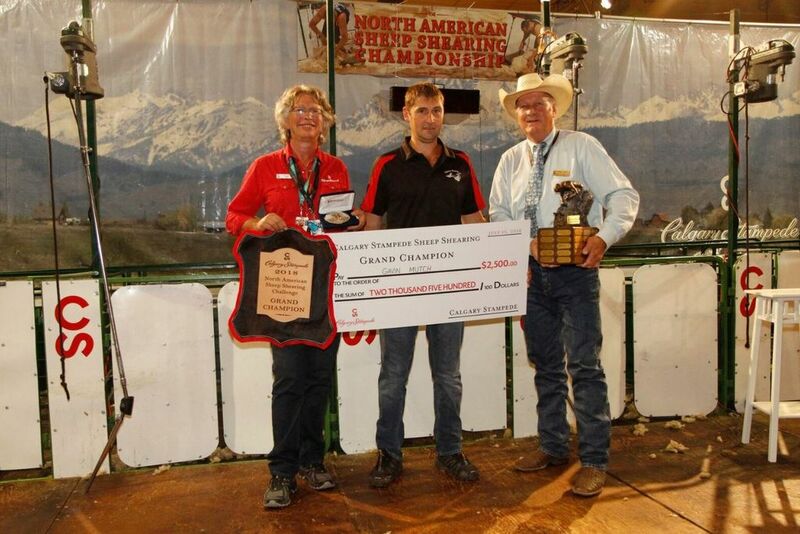 For the full results from the North American Sheep Shearing Challenge, visit ag.calgarystampede.com/results.